Scotland's coal industry has warned that the impact of cheap imports is putting jobs at risk. 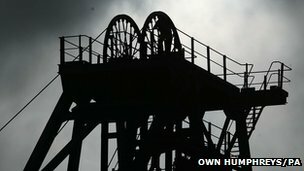 Scottish Resources Group (SRG) has told 450 coal miners they could be facing redundancy as the firm faces intense foreign competition. The National Union of Mineworkers said it could affect six out of the eight surface mines operated by the group. It has called on the Scottish government to help the company through cash-flow problems. Some coalfields had been nearing the end of production, while new developments have been put on hold. The company has confirmed they have entered formal consultation on shrinking the workforce, but have not given numbers. It currently employs 758 people. A spokesperson for SRG said: "Coal still consistently provides between 40% and 50% of the UK's electricity needs and demand remains high. "However, Scottish mined coal is priced in relation to global pricing trends which have been at record low levels. "This is mainly due to a massive expansion of 'fracked' shale gas in America, which has displaced their coal onto the international market." The company said in the short term this would mean that a number of new sites which have either been given planning permission or are currently awaiting a decision, will be not commenced immediately. SRG has said there would be "a temporary reduction in productive capacity" until the new sites were commercially viable. The spokesman added: "We do, however, expect prices to continue to rise which will allow companies like SRG to re-establish former levels of production. "And despite current challenges, the long-term future for UK coal production looks very positive. "SRG is currently in discussions with all its stakeholders, its employees, the Scottish government and the councils where the operations take place and would like to express its gratitude for all the assistance being given." Nicky Wilson, national president of the National Union of Mineworkers, said: "The crisis has been created by factors outside the company's control. "Fracking in America is forcing down the price of coal. What's been created is a short term cash flow crisis for the company, so we're looking for the government to step in". The issue was raised at First Minister's Question by SNP MSP Adam Ingram, who said hundreds of jobs and the wellbeing of communities in Cumnock and Doon Valley were dependent on SRG. Alex Salmond responded that he shared the MSP's concern. He said: "Fergus Ewing, the minister for energy, has been working closely with the company and others to do all we can to help. "We'll do everything we can to assist SRG to maintain operations as a priority. And of course, we'll provide support to those facing redundancy." Last week, Hargreaves Services, a coal-mining and logistics company based in Durham, bought the debt linked to secured assets that belonged to another big Scottish coal producer ATH, which was forced into administration in December. The Scottish government is supporting the move which appears to be intended to continue operations at ATH's sites, where 300 people have been employed. Hargreaves is restructuring the ATH operations in a bid to make them viable, while also pledging to use profits towards the restoration of surface coal-mining after operations are complete.